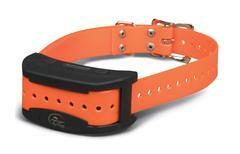 Additional collar for SportDOG Contain-N-Train System. Your dog wears a Collar Receiver with Contact Points that touch his neck and, once trained, is allowed to roam freely in the Boundary Area. When your dog reaches the Warning Zone, the Collar Receiver gives a warning beep. If your dog continue Collar Receiver has rechargeable lithium-ion batteries s into the Stimulation Zone, a safe static stimulation will be delivered through the Contact Points to get his attention until he returns to the Boundary Area. Containment Mode: 7 levels of static stimulation and Vibration/tone option. Training Mode: 7 instantly selectable static stimulation levels, Low/medium/high stim ranges, Vibration and tone options. Product dimensions: Collar Receiver without strap - 3.4"L X 1.4"W X 1.6"H.